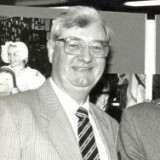 A regional daily’s former chief photographer described as the “consummate professional” by former colleagues has died aged 86. Tributes have been paid to John Esplin, left, who worked for the Greenock Telegraph between 1977 and 1994. John’s photography career had begun as an amateur with the Greenock Camera Club, before setting up his own business and freelancing for national newspapers. George Munro, who succeeded John as the Telegraph’s chief photographer, said it was a “great privilege for him” to work as his assistant. He told the Telegraph: “Press photography requires a different skill set from that of a commercial photographer, and I was lucky to work closely with one of the best in the business and someone who had quite literally ‘done it all’. Former Telegraph editor Ken Thomson described John as “a true photo journalist who was always full of enthusiasm”. Greenock-born John had completed National Service with the Royal Air Force in Yorkshire, which led to a lifelong link with the RAF Club in the town. He is survived by wife Nan, Alison, son-in-law Jim, grandchildren Craig and Lynn and great-grandchildren Ross and Nicola. John’s funeral was held at Greenock Crematorium at noon yesterday, which would have been his 87th birthday.